Reposition Bic sticky notes again and again. 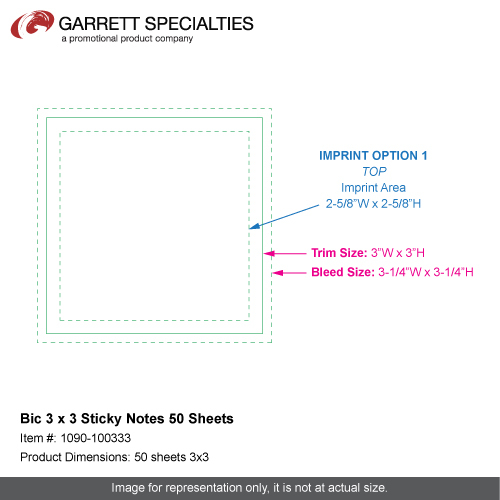 Trusted Bic sticky 3in.x 3in.adhesive notepads. Useful office item and great promo for any industry. 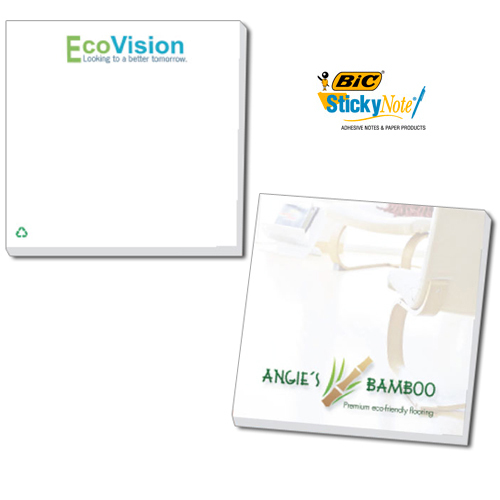 50 Sheets - Your message will be the first thing they see on the 3" x 3" adhesive notepad! This attractive, convenient, USA-made pad is always in stock. Change the paper color with a free flood coat. There is no charge for bleeds. Free phantom imprints create visual interest! Have your logo imprinted with four color process and create a piece that will spread your message anywhere it sits. Banks, realtors and many other businesses are great promotional fits! Bulk / 8 lbs lbs / 125 pcs. Imprint Area: 2 5/8in. x 2 5/8in. Scratch Pad- 3 1/2" x 8 3/8"